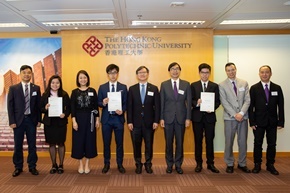 On behalf of the Hong Kong Special Administrative Region Government, the Deputy Secretary for Transport and Housing signed an agreement with the Dean of Faculty of Business of the Hong Kong Polytechnic University ("PolyU") on 15 June 2018 regarding the Hong Kong Nautical and Maritime Scholarship Scheme ("the Scheme"). The ceremony was witnessed by the Chairman of the Manpower Development Committee ("MDC") of the Hong Kong Maritime and Port Board ("HKMPB") and during which the awardees of the Scheme were presented the scholarships. The Scheme marks an important milestone in nurturing the seafaring and maritime talents for the Hong Kong maritime industry. The Scheme is sponsored by the Maritime and Aviation Training Fund of the Transport and Housing Bureau and commenced in the 2017/18 academic year. 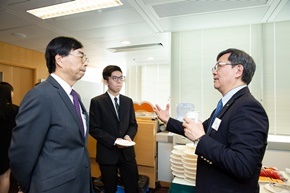 It is established for students of the Bachelor of Business Administration (Honours) in International Shipping and Transport Logistics Programme of PolyU. The Scheme consists of two parts, the "Seafaring Scholarship" and the "Maritime Scholarship". The "Seafaring Scholarship" aims to encourage youngsters to receive seafaring training and pursue a seafaring career in order to supply seafaring professionals for the maritime sector. Each award will receive a scholarship of HK$60,000 per year for two years, i.e. the 3rd and 4th years for HKDSE intakes and the entire two years for higher diploma level intakes; the “Maritime Scholarship” aims to encourage students with excellent academic results to study the degree programme in order to nurture talents for the maritime industry. Each awardee will receive a scholarship equivalent to the tuition fee for four years. Chairman of the MDC of HKMPB and the other guests presented during the ceremony the scholarships to the two awardees of the "Seafaring Scholarship" and one awardee of the "Maritime Scholarship". Scholarship recipients of the Seafaring Scholarship will be required to work full time onboard (sea-going seafaring) for a period of not less than 18 calendar months; and for the Maritime Scholarship to work in the maritime industry in Hong Kong for a period of not less than 12 consecutive calendar months.